Coreshine from the Lynds Dark Nebula 183 [or L183 or LDN183]. The heart of the cloud is revealed by the strong scattering of mid-infrared light by micrometer-sized grains. This phenomenon is present in half of the studied objects. Lightfrom the cosmic clouds where stars and planets are borncould soon reveal secrets about these mysterious formativeregions, a new studysuggests. Coldmolecular clouds are the cradles of stars and planets, where denseclusters ofgas collapse to form protostars and immense clumps of dust grains canbecome Earth-likeworlds. But just how this happens is largely unknown, in partbecause theclouds shroud what’s going on, so astronomers can’t see the action invisiblelight. Theinfrared beams detected from L183 were likely the result of starlightpassingthrough the cloud that got scattered off dust in its core, the cloud'sdensestregion. The specific wavelength of the rays suggest the dust grains hadto beat least 1 micron in size, or roughly a hundredth the width of a humanhair. "Youcan think of the grains as small mirrors," said researcher LaurentPagani,an astrophysicist at the Paris Observatory. "If the mirror is muchsmallerthan the wavelength, the light will not notice the mirror." Thissize would make each grain about 10 times wider than the average dustmotesthought to make up these clouds. As such, this radiation could yieldinsightsregarding how the construction blocks of stars and planets grow. Nowthe scientists reveal this coreshine effect is not limited just toL183.Instead, it is actually common in many molecular clouds across thegalaxy.Pagani and his colleagues used Spitzer to investigate the cores of 110different molecularclouds, and about half of them clearly gave off coreshine. Furtheranalysis of coreshine should reveal details about the properties of thegrainscausing this light. Since the size of the dust grains should grow overtime,the coreshine should also shed light on the age of clouds, Pagani said,and thelocation of this radiation within the cloud could yield insightsregarding itsinternal structure. Allthis information could ultimately help scientists understand howplanets and stars form. "Fora long time, models of dust growth were far too slow — typical times ofhundreds of million years — and were not trustworthy," Paganiexplained. 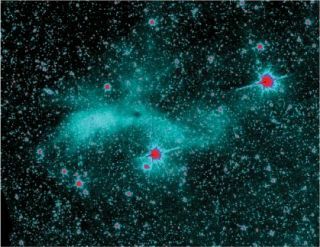 Hesaid a new model designed by his colleague Chris Ormel of the MaxPlanckInstitute for Astronomy in Heidelberg, Germany may prove more accurateandmatch the recent observations. Paganiand his team detailed their findings in the Sept. 24 issue of the journalScience.